Thirty-seven years ago, Shiloh members stepped out in faith and built an auditorium even after the bank denied us a loan. They gave from their hearts. Our church has a long history of answering the call of faithful, sacrificial giving. We have seen God show up time after time by touching hearts, answering prayers, and accomplishing more than we ask or imagine. In Exodus 35, it says “…everyone who was willing and whose heart stirred him came and brought an offering to the Lord.” On Reach Sunday, September 30th, we will have an opportunity to bring our own offering. One that is given out of love, moved by thanksgiving, and brought by remembering how God has blessed us. Please pray we will feel the Lord stirring our hearts. This is not about money; it's about our faith and our trust in God. We will leave a legacy through our giving just as Shiloh members did many years ago. We pray that 37 years from now our children and grandchildren will be worshipping here. Our gift has the ability to transcend time. We are Reaching Today Into Tomorrow. 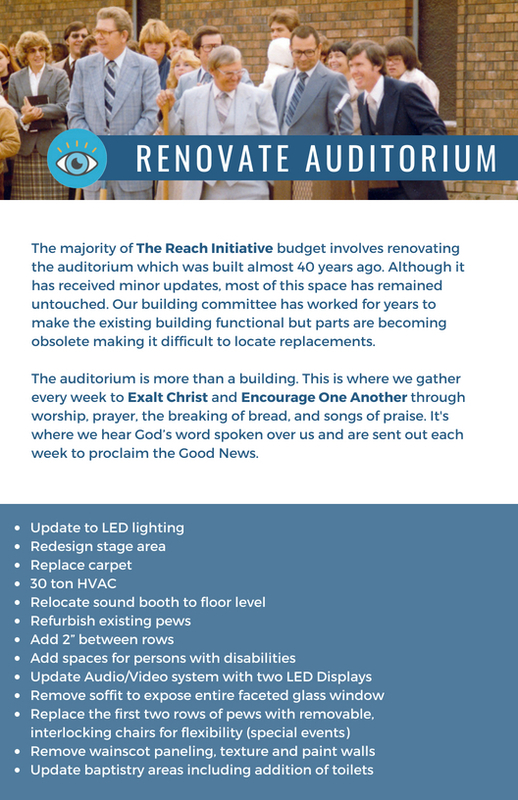 Click here to learn more and view specific renovation plans for the auditorium. 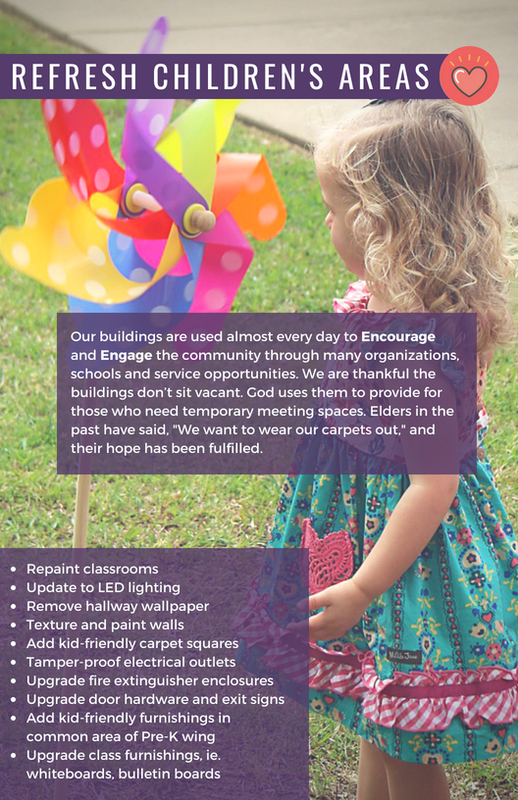 Click here to learn more and view specific renovation plans for the children's areas. Click here to learn about our ideas regarding funds to Engage Our Neighbors. As we begin our spiritual journey towards Reach Sunday on September 30th, we ask that you equip yourself spiritually through daily prayer and a commitment to fasting. This is an opportunity for our church to see firsthand God working in our lives and multiplying our gifts. On Tuesday, August 21st, we will begin 40 days of fasting and prayer. We would love for you to join us using the sign-ups located in the foyer. Select the day(s) you will be fasting. Write down from what you will be fasting. We realize not everyone is physically capable of fasting from all food or drink, but everyone can abstain from items or activities like sugar, coffee or watching television. Pray as you abstain. Let the void from something you would normally do be a reminder to pray. We encourage you as individuals and families to pray fervently during the 40 days leading up to Reach Sunday. Specific prayer topics will be provided weekly at church and are also available here. 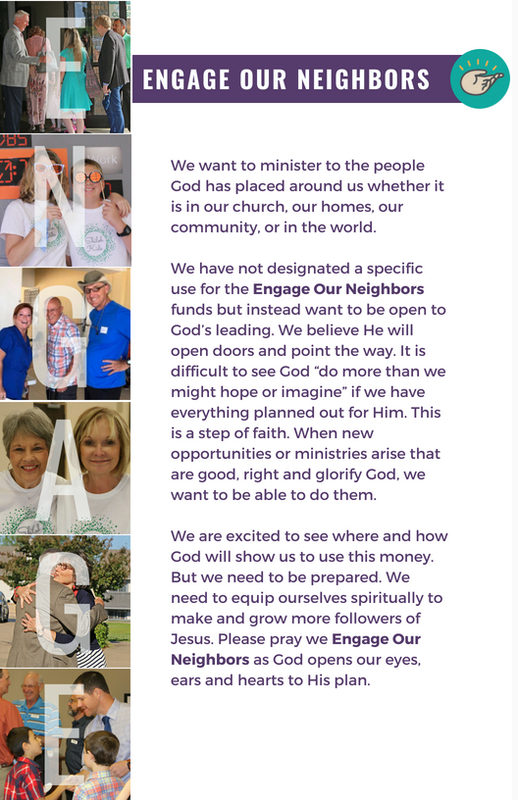 Please consider and pray about how you should be involved. If we humbly ask God to show us, He is always faithful to answer.